Head injuries are one of the most serious risks associated with SUV rollovers. These injuries can be caused by roof collapse, violent movement of the head and neck, or collision with the dashboard or other object. Individuals who suffer serious injuries may be forced to deal with damage to the brain that may be debilitating or even fatal. If you or a loved one has experienced traumatic brain damage following an SUV rollover accident, you may be entitled to compensation for your medical and financial losses. To learn more, call the rollover brain injury attorneys of the Willis Law Firm at 800-883-9858. These symptoms can range from mild to severe, and may be temporary or permanent. Often, head injury victims need extensive rehabilitative treatments to regain some of their lost functioning. Sadly, some experience symptoms for the rest of their lives. No one should have to live with the consequences of a brain injury due to another party’s negligence. Our SUV rollover traumatic brain damage attorneys are committed to helping victims fight for the full compensation they deserve. If you have been affected by a head injury caused by an SUV rollover accident, we are here to help. 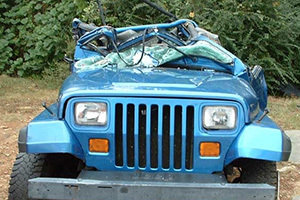 Contact the SUV rollover brain injury lawyers of the Willis Law Firm by calling 800-883-9858.